Glass Bending. Optical Data Transfer. Case studies are shown for obtaining smooth or tunable asperity or hard coatings, ionic-deburring, abrasives manufacture for biomedical (with possible C3N4), tool bits and other uses including difficult glass bending. Rightfully called a low operations-cost miracle beam. The case studies are just a simple introduction to the incredible potential of the Cascade e-Ion Plasma™. For more information or questions please contact MHI @ 513.772.0404 or use our contact form. Most of the procedures for creating coatings with the cascade e-Ion machines are a simple two step process. These steps will allow good thickness nanometer to micron thickness coatings for in-situ nitrides, oxy-nitriding titanium, manganese, chromium, tungsten, iron-alloys or other similar metals in about ten to fifteen seconds of exposure the cascade e-ion beam. Glass Bending. Optical Data Transfer, Biomedical Coating/ Debur, Tool-bit Reconditioning, Abrasive Wheel, Cast-Iron, Stick Resistant Steel Surfaces, Anti-Seize Treatment for Steels Bearings, Bolts & Bushing, Protect Magnets, Request Information. Reducing friction is an import goal for energy savings, in the 2013-2014 time frame (~120 ExaJ) of energy consumed was from friction based contacts (reference https://doi.org/10.1007/s40544-017-0183-5). One way is to manufacture or finish with improved low friction surfaces with the cascade e-ion The procedure to use is fairly simple. (2) Expose to the non-combustion, ion-containg plume*. When done turn it off. Step 1 (Start CleanElectricFlame™ Plume). A MHI provided blower may be used. Start the CleanElectricFlame™ by switching on the Cascade e-Ion and the air/gas flow. This will produce an ionized plume with plume characteristics that depend on the gas. *Air or Nitrogen or other gases may be ionized when passed through the Cascade e-Ion units and machines. The deep Golden Titanium Oxy-Nitride coating for biomedical parts and the GoldenBlue™ coating for significantly enhanced tool bit wear resistance, dry lunricity and rapid machining are routinely made in ionized air. There is no combustion or carbon product in the plume, unless desired, or intentionally added. Cost and Value Comparison. Compare Plasma with Nitriding Furnaces, Lasers, PVD and CVD. Conventional nitriding is done with a 100-300kW heavy nitriding furnace (please note that nitrides are quickly oxidized in air so the correct term is oxynitriding). The Cascade e-Ion machine use only 15kW. Comapre with 300kW Nitriders: The one hour operational cost for a 300kW machine at 10c/kWh is $30. The one hour electric operational cost for Cascade e-Ion is about $1.50. For 200 days this equates to $144000 vs.$7200. More than likely you will also produce considerable more parts with the Cascade e-Ion solution. Most nitriding furnaces are expected to be left 'On' for days. On-off is a way the cascade e-ion is used. Experience the difference. Test your parts and speed of manufacture - at MHI if available as a program for your part. Take the plunge - literally, for your part into the plume! Make Oxy-nitrides, carbon-nitrides, silicon carbonitrides and aluminides by contacting MHI or one its its numerous application partners. Uses from wear (automotive), catalysts production to solar cells. Please check out the anti-stick or stick resistant insitu coating case studies for cast iron or steel surfaces. Contact MHI for meaningful results that matter to you. Surface hardness to expect for the Cascade e-ion iron based coatings range from about 700Hv for cast irons to 1500 Hv for worked steel, tool steels and other high alloy steels.. Almost all steels and irons can be cascade e-ion oxynitrided. The process offers good advantages for fatigue life increase, low wear because of adhearance, case depth and low friction. Unusual non stick properties are also feasible for almost all steel surfaces. Save energy, improve productivity and enjoy unusual properties. A Return on Investment Scenario is given here.. Please note that this is only one scenario and your own may be very different. All the major assumptions are called out. Regardless before using the numbers, please contact your own financial professional and also MHI to verify what conditions apply for you. Low cost from low friction for valve bodies, heads, screws, barrels, molds, guides, valves, sleeves, ejector pins, crankshafts, timing gears, cam shafts, transmission ring gears, push rods. screen changers, extrusion dies, ball valves, valve spools, shafts, seals, forging dies, bearings, sleeves, cams, ball bearings, nuts, bolts, rocker arms and more. .. versatile surface engineering possibilities. Do unusual surfaces like manganese, chromium or other transition metal oxynitrides nitrides.... the new buzz. Step 2 (Immerse parts in Plume). That's it! Analyze, the new shiny surface for the correct rms and skewness. The return on Investment is high. Please contact MHI for More Information. We will compare prices of both furnaces and operational cost. For your convenience, some useful financing links and resources are provided on our website. Titanium Nitride and Oxy nitride Coating with only Air Input! Cascade e-Ion Plasma™ Applications and Case Studies. Process without Vacuum. Just with air but if you choose to the Cascade e-ion can operate with Nitrogen, Argon and other gasses like Forming Gas. From glass to 304/314 steel consider forming oxynitrides (the word oxynitride is used because no nitride is generally stable against oxygen). Create the smoothest operational materials for materials handling leading to improvements in belt life. By manipulation of the aperities and the material for the contact angle, power plants can now have unusual water repellent surfaces in turbines and other parts that normally encounter erosion from droplets. Non-stick coatings for semiconductor IC packaging, molding dies; surfaces that resist sticky fatty acids; even for cast irons. Easily form hard but lubricating coatings for all types of challenging surfaces where life and process improvements make it competitive for you. Contact MHI for rapid peening/co-nitriding for metals used in spinal systems to fatigue resistance enhancing surfaces of metals, ceramics and glass. Compare machine price and operational prices of the Cascade e-Ion Plasma™ with lasers, ion implanters and electron beam machines, CVD, PVD type units that may have similar potentialfor surface engineering. Compound layers and phases in low alloy steels can be formed in short duration. For hot dies there is a good possibility of an increase in wear and fatigue life from low coefficients of friction, high hardness and other features..
For tool-bits of HSS a small exposure makes the surface hardness increase from 900 Vickers to 1300 Vickers as measured by our customers. In comparison with DLC coatings the Cascade e-ion oxynitride coatings are rated to a much higher temperature. Use for dry or lubricated consitions.. Wear is low because of the consistent low friction that makes and the ability to dissipate heat. 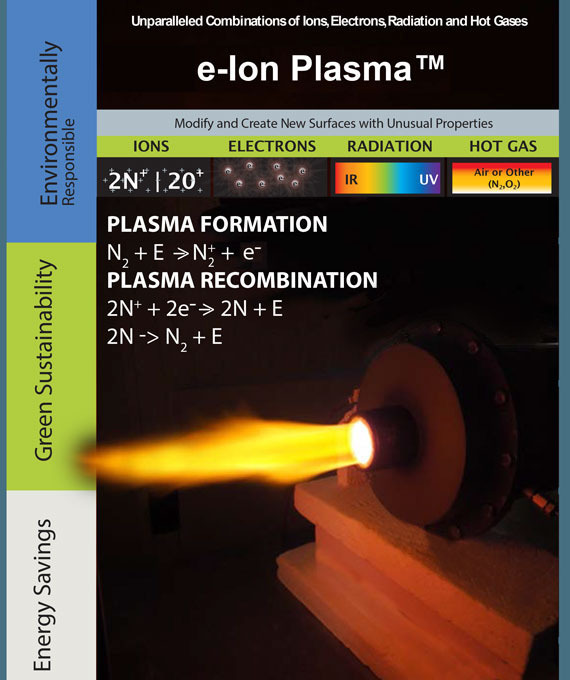 The Cascade e-Ion Plasma™ Models produce the CleanElectricFlame™. The picture on the left shows tappets and outlet valves GoldenBlue™ by the Cascade eIon™ process for Low alloy medium carbon manganese containing steel. Picture on the right shows treated biomedical implants. Impart rapid water repellance. Glass bending, smoothening, shaping. Case studies for optical data transfer glass. Better user experience because of smoothness and water resistance. Bring your intelligent designs to life with creative shapes made with the Cascade e-ion rapid glass bending technology. 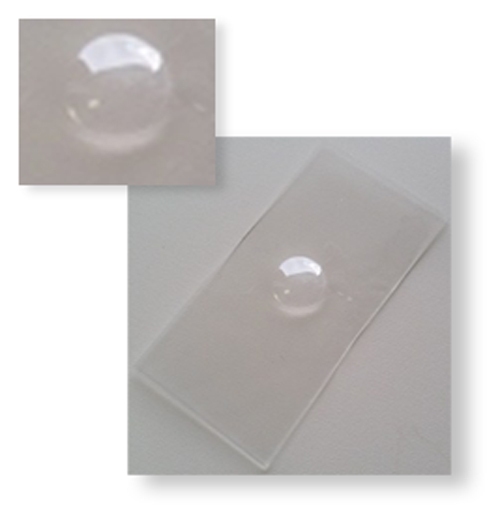 Surface harden optical data transfer glass with super ionic rapid impingement of nitrogen with just air input. Protective glass that is used in electronic displays is surface treated and/or bent for reasons that involve design as well as information selection and transfer abilities. Creating elegant curvatures and variations in surface properties can be used to distribute information creatively in electronic displays. The cascade e-ion brings new versatility and opportunities to glass processing. Glass bending requires that a glass (disordered internal structure) be heated above a temperature (e.g. glass transition) and deform into the shape required with the correct apparatus and wavelengths. Shaping is an art. Exact conditions for shaping vary from glass to glass with changes in the composition, and details of the internal atomic disorder. Glass is bent for decorative reasons as well as for altering the direction of information display. The cascade e-Ion uses super ionic pressure that can be used to deform the glass without cracking. Simultaneously, often the scratch resistance and smoothening is enhanced. Have your glass tested. Bend cell phone glass, wrist-information watch glass, GPS glass, electronic glass, smart phones, sapphire equivalents, touch screen glass, tablet-glass and do so much more at rapid production rates . Bring your intelligent designs to life with creative glass-shaping offered by the Cascade e-Ion wit super hard surfaces also if desired. Change the surface characteristics and heat resistance with very low operational cost. Bend and/or surface smoothen. Treat glass with the slot aperture Cascade S-e-Ion in the plume-mode with the air-plume shown below. What to buy from MHI The Cascade S-e-14, and the special substrate, machined to your curvature/dimensions. Create beauty, differentiate your product, change brightness/contrast and creatively distribute or capture useful information. Multi angle displays and curved glass - please let your imagination consider hard glass cover shapes with the Cascade e-Ion machines. Want to do simultaneous ionic hardening. When you purchase a cascade machine you are freely enrolled in the expanding the group knowledge and in the Never Down system. Want an ROI from MHI? Please do not hesitate to request a sample ROI. The surface properties of many glasses that are super ionically bent/shaped were found to be much more scratch resistant. This is a key requirement in optical data transfer glass and laminates. The Cascade e-Ion technique can do shaping rapidly for production - bend in less than a minute - because of the unique ionic beam which protects the glass while bending and distributes heat evenly. Considerable variations in creative bends may be achieved. Even the hook and multi-axis bends including convex and concave as shown for the illustrative hat-curvatures as shown above are possible - please contact MHI for information. Several complex shapes for advanced electronic display glass (for all types including aluminosilicate glass) are shown below. Many other shapes are not shown because the user has requested that we not disclose until they have entered the market with their shape. The Cascade e-ion machines/models do the perfect job. MHI provides Jigs as appropriate for a nominal price. MHI delivers capability to design. Super ionic bending. Use the Cascade e-Ion Plasma™ to bend, treat or shape glass! Clean and quick results. Energy Efficient. Ionic modification possibilities for wear resistance and smoothness. The Cascade e-Ion Plasma™ (a Patented MHI product) can be used to bend glass i.e.,the ions can be used to manipulate glass bending. The Cascade e-ion Plasma operates at about 1-15 kW. In contrast, certain types of soda-lime-silicate glass is often bent by heating in very energy inefficient furnaces (almost 50kW) i.e.. if at all bendable from flat shapes. Wish to bend quartz or sapphire glass or three dimensionally form glass? Single operation surface ionic operations and tempering are often feasible with the Cascade e-ion machine-endefactors. 4DSintering is a registered trademark of MHI. Bending is easy with the Cascade e-ion technology. More than bending can be attempted. For example MHI is working on uniquely exciting ion-hardening techniques that use the ionic nature of the beam to successfully modify several glass and sapphire substrates. The purchase of an Cascade e-ion machine enrolls you into the select group. We know you will enjoy the new ideas that come from you and others. MHI Cascade e-Ion Plasma™ allows rapid bending of flat-glass. The photographs show electronic glass smoothly bent within a few seconds in the CleanElectricPlume™. Please call us @ 513.772.0404 or contact us for more information about this innovative technology. Many shapes are possible such as decorative dimpled surfaces, origami shapes, hierarchial crystal, and folded napkin shapes. These shapes can be produced by simply applying the correct bend points with the cascade e-ion machine as shown below for curved surfaces. All shapes can be made in a rapid energy efficient manner while not losing any significant properties of the glass. Regardless, specific testing on your glass is recommended and is often free. Please contact MHI for acquiring a glass bending machine suitable for your design. Shapes are normally made within a minute from flat plate condition - fully automatable with continuous belts and appropriate robots. Other materials handling systems may be incorporated. Design creativity is particularly empowered by the Cascade e-Ion System. In the picture below the axis points for curvature origin are shown. These are edge reflections of a bent glass. The Cascade e-ion Plasma and special MHI jigs enhance such creative bending. Note that the Cascade e-ion is offered with many different types of apertures. Is Glass a Solid? Ask MHI. Answer: Glass below it's glass transition temperature is a solid in the sense that it has a very high viscosity and therefore is very rigid (does not shear easily). 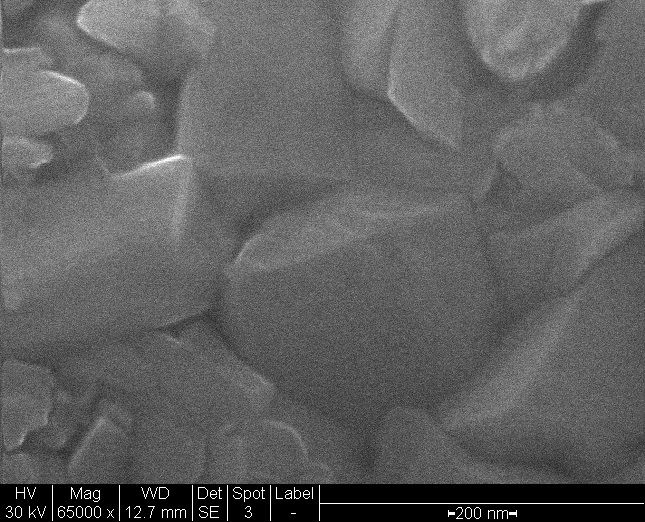 Both crystalline and amorphous ceramics can be transparent in the visible range. Glass is a term commonly used for a transparent amorphous solid. Glass has several applications such as windows, electronic displays and also for transparent armor and coatings. Several glass compositions exist. Some of the common ones are borosilicate glass, normal glass (i.e. plate-glass soda-lime-silica), and other combinations of fused silica glass. Cost considerations play a role in the selection process when shaped glass is required. Here is where the cascade e-ion has a particular advantage for volume rapid production. Chemical, Ionic or Thermal treatments can increase the strength of glasses. The Cascade e-ion is versatile. The controlled crystallization of certain glass compositions is also employed for optical quality glass-ceramics manufacture. With the cascade e-ion several active gas and ionic covers can be contemplated even to consider SiAl-oxynitrides, known as SAILONS. Other new materials may be contemplated. In a sense the Cascade e-Ion has made the future a bit brighter. Wish to edge bend, surface harden, smoothen and make water resistant a layered or laminated glass? Please consider whether a cascade e-ion model may fit your requirements? Biomedical Coatings on Ti6Al4V, Stainless Steel and Other Titanium Alloys. Case Study. 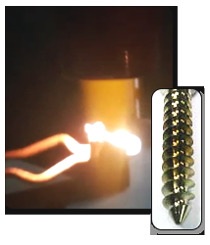 Exposure to air-based Cascade e-Ion plume produces a fine gold color coating (shown below for a biomedical insert screw) on biomedical Ti/6Al/4V alloy with the following EDAX spectrum. Coating creation and refurbishment is greatly simplified. Use just air for input gas as described below for the EDAX result or use nitrogen gas or forming gas as required. Almost all customers who consider the Cascade e-Ion for an application or to GoldenBlue™ request Deburring of parts. The Cascade e-Ion Plasma™ is used for Titanium Alloys (including multilayer graded peening), Co-Cr-Mo type biomedical alloys, stainless steel alloys, high density plastics, dental alloys, gold alloys, superalloys, or for surface and other conditioning of Nitinol, Ni-Ti, Ti-Al, Ti-6-2-4-2 (such as Ti-6Al-2Sn-4Zr-2 to 6Mo) shapes castings, forgings and many others. 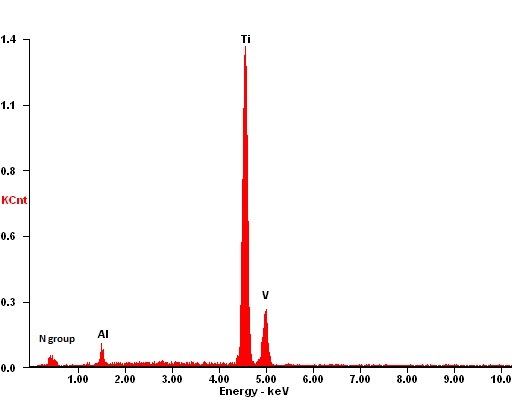 Nitriding of Ti-6Al-4V with the Cascade e-Ion Plasma™ improves Ti6Al4V surface properties for biomedical use. Please Contact Us for your specific application. 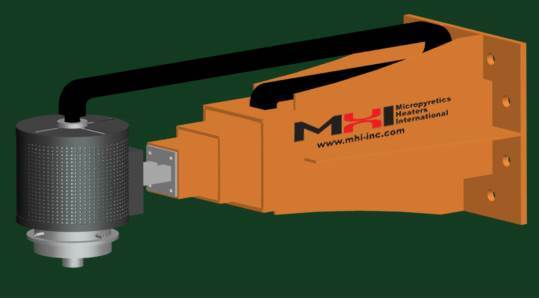 MHI offers complex part manipulators from robotic arms to continuous belts. Cascade e-Ion Models that are applicable for oxynitriding and surface coatings. For nano-porous surfaces use the de-e-Ion machines. Tool-bit Industry such as drills, end-mills, broaching tools, rams, inserts, cutting tools, deep draw, cylinders like master pump, slides, bearings rollers and ball bearings. Automobile or sea-borne vehicles from use in related steel, aluminum and plastic industries that include turbines, shafts, spindles, gears dies, extruders molds, bearings, crankshafts, camshafts, gears, pistons, cylinders, springs and valves, rings, dies and molds. Molds in casting and plastic and die casting Industries. Forging and forming industries for operations including forging and pressing which could include cold forging, shape forging for impressions, open die forging, hammering and bending. The smoothness (low coefficient of friction) properties are particularly important for bearings and busings even when sealed. MHI finds that chromium, iron, titanium (transition metal) oxy nitrides are particularly useful even when compared to regular nitrides as they work towards lubricity, low wear, low coefficient of friction, low galling and have a very attractive surface look and feel. The cascade e-Ion plates ions continuously in air. Please take advantage of this feature and be to your market first. GoldenBlue™ Case Studies for Machining. Easy multi color tool-bit reconditioning with the cascade e-ion family of machines. Less machine chatter, reduced galling, enhanced life and a smoother cut is always a good outcome. MHI offers a GoldenBlue™ thermal plasma reconditioning and nitride coating service whereby GoldenBlue™ coating is applied to tooling, parts and surfaces. This application will provide greater hardness, increase wear resistance and extend surface life for a variety of materials and alloys. The GoldenBlue™ service is available through MHI as well as from approved vendors. Is there a simple way to tell if the Cascade e-Ion Plume treated part is smoother? Less noise is an indicator of smoothness for a ball bearing, roller bearing or other part. How do you know that the surface is harder? Bounce the ball bearing and watch if it bounces higher than the non-coated? The insitu-growth coating that forms on exposure to the cascade e-Ion beam very often has low lubricity and high surface hardness. Saves energy of machining. Saves tool resources and offers many more benefits. 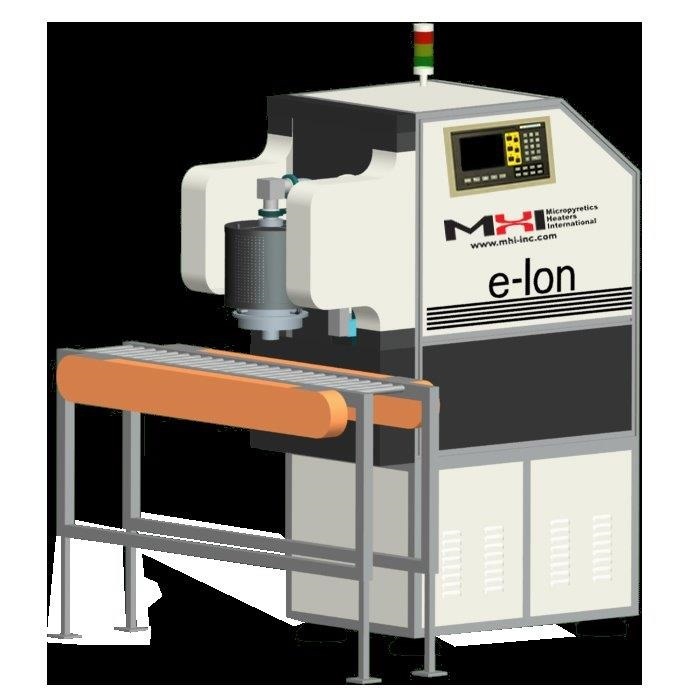 Please have your prototype tested free at MHI and if convinced then please consider the purchase the cascade e-ion or send to MHI for paid service. Improved coatings on high speed machine tools, cutting knives, blades and even for recoating thin razor blades when coated properly. Transform and re-use (recoat) at will, resharpening when possible. GoldenBlue is trade name for service and multi color high-value coatings. The composition depends on the substrate. It is a sometimes a Fe-Ti-Al-N-W-C type coating for HSS. One which is which is ultra-hard and ultra-smooth. Low coefficient of friction ~0.1 ( number depends on surface). The hardness and lubricity depend on the substrate and coating thickness. A hardness of about 13GPa is equivalent to a Rockwell C of about 75 Rc however Rockwell C scale is not really meant for such high hardness or coatings. The Cascade e-Ion machines offer easy nitriding/oxynitride of tungsten cobalt, stainless and titanium alloys (almost all transition metal alloys). High hardness, good lubricity and multi-element stable coatings are made in situ by the cascade e-Ion plume impingement. 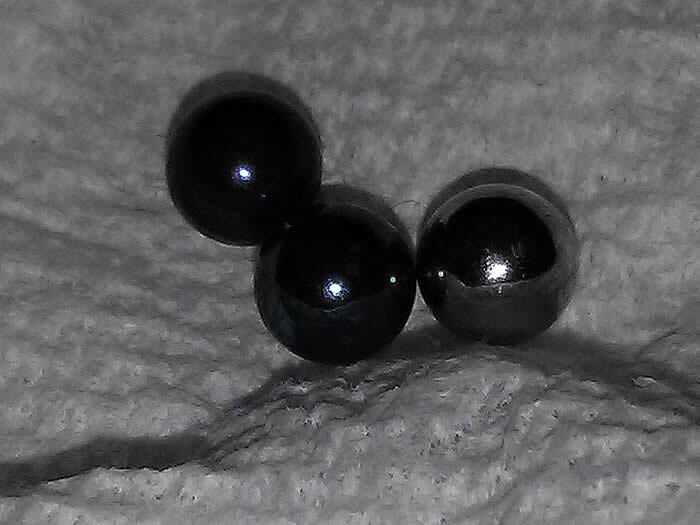 GoldenBlue™ - this is a trademark to signify the multi-color hard in situ coating. >3000 Vickers (nano) as an example. One of the best for high hardness, low coefficient of friction, improved drilling speeds and other benefits like less heat and less chatter depending on substrate. Use for stainless to hardened die steel to even ceramics. Try GoldenBlue™. The process is simple. Immerse or move the part in or under the special CleanElectricFlame™ that is produced by the Cascade e-Ion™. Process for about ten to fifteen seconds (for a inch or so thick part) for the build up of a four or five micron coating thickness of the type A or type B GoldenBlue™ coating. The expectation one should have is for about a 15% tool life speed improvement per hole, over the uncoated (such an improvement is in the same range as the regular TiN commercial coatings, at least as noted in our limited trials). The total life improvement could be almost double (depends on part size and type). The GoldenBlue™ - B offers even better expectations of about a 25% improvement in speed over a regular HSS-uncoated. These results are not guaranteed as they dependent on specific tool type and use. 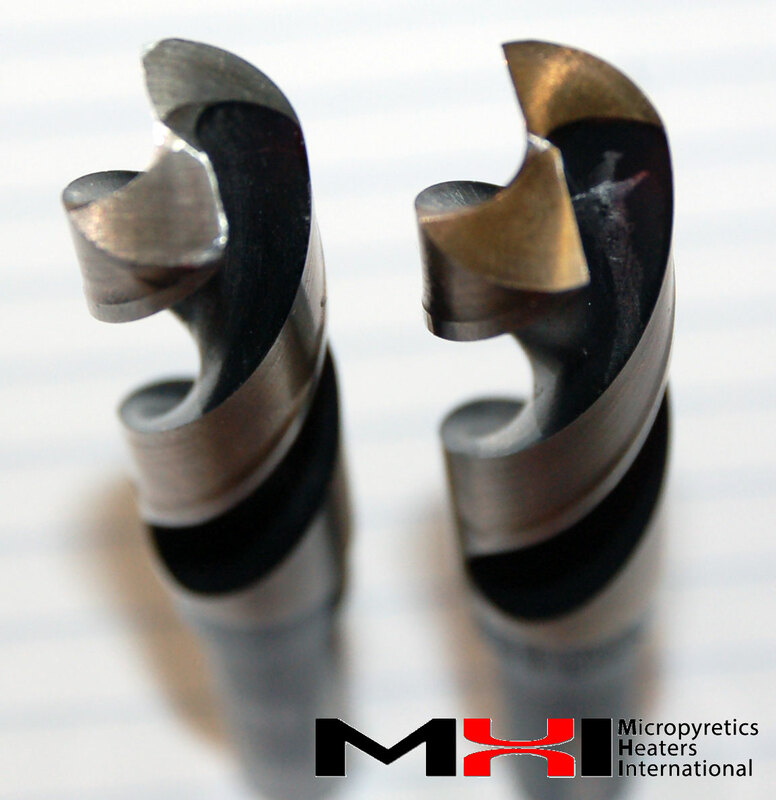 Improve carbide bits: Yes - coating is feasible on end-mill carbide inserts. In situ-coat many types of punches, dies, and other surface. Please do not hesitate to send us your specific tool or typical surface for trials so that your specific tool or surface can be coated for you. 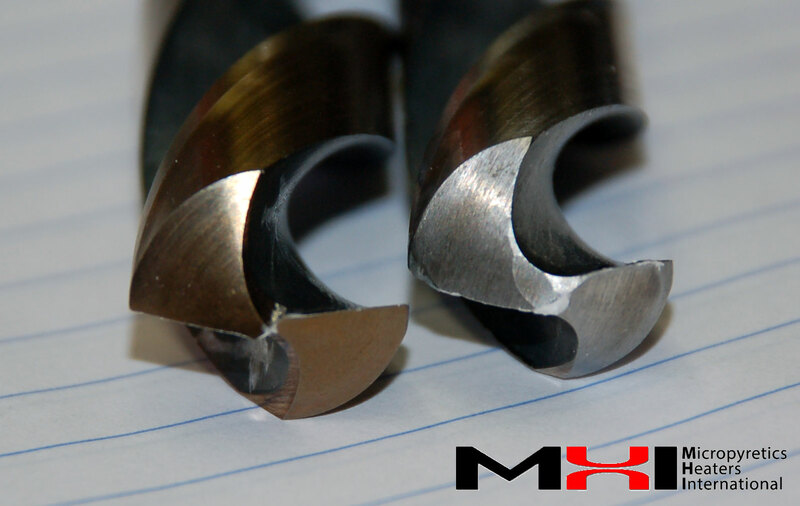 We can also determine if your tool bit may be reconditioned to GoldenBlue™ grade. Early stage, first time use customer testimonial: "We ran one of the inserts on 17-4 stainless steel on our CNC lathe........The coating did seem to make a difference. I would say at least 15 to 20% better than without it. I ran the small insert on 1045 steel. Bored 40pc with 2 passes for each bore. One thing I noticed right off the bat was,the coating gave an improved finish over a standard insert finish. I did not have to change insert and finished all 40 pcs without the tool breaking down!" MHI to Customer: Thank you so much for sharing the result. Please allow us to express our gratitude and permit us to do more of your tools - of course at no charge. Try us out at no-obligation while this offer lasts. The available technology for surfaces and tool bit is changing rapidly. How does one compare drills and other such tools? The following check list may assist your evaluation. 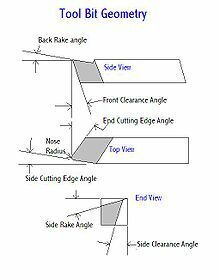 (1) For the same sharpness (radius of the edge), compare drill or cutting time,. (2) For same sharpness, compare the life of tool before it begins to screech or leave behind burns, (3) compare the overall cost of the value addition i.e. compare the improvement per unit cost including the cost of the of tool, cost of operations, cost of change/wait period, (4) determine whether the tool may be reused after coating and or after re-sharpening, and (5) if applicable, whether a sharpened tool may be recoated. With the cascade e-Ion processed tools we saw better drill speed (we were able to double the speed in a drilling experiment), improved sphericity of hole, cleaner breakthroughs, smoother tapping control for tapping tools. All this results in more energy efficiency during manufacture and drilling/tapping because of the GoldebBlue™ treatment/coating. With the Cascade e-Ion processed surfaces we saw improved smoothness as measured by chatter, quality of the cut, with no seizing and less heat generation. Thus giving confident and longer lasting tool expectations. The smoothest and sharpest. Contact us for comparison information. Save energy. Repair rapidly at will. Enjoy improved performance. Reconditioning of Spent Abrasive Wheels. Case Study. Many abrasive wheels can be reconditioned by exposure to the clean plume. Please ask for a case study or send us your wheel for free reconditioning trial. Hardfacing is feasible for small to very large surfaces that are used for boring and grinding. Please contact MHI for feasibility assessment. If you already own a Cascade e-Ion machine. Immerse part that needs surface conditioning into the CleanElectricFlame™ and remove quickly from flame within seconds depending on size. Please contact MHI for process advice. The picture above shows how the part is held in the CleanElectricFlame™. 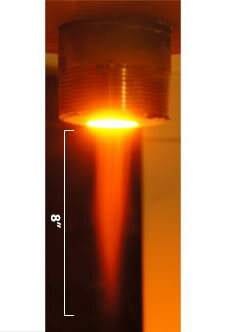 Air was used in the Cascade e-Ion Plasma™ generator which then ionized and quickly formed a hard shiny abrasive surface. Used for grinding hard ceramics. Flexibility of Operation. Do one part or many parts. Follow as -required, turn-on and shut down and idle parameters. Avoid traditional processing-time of days. No vacuum requirement. Part manipulators can be robots to belt machines or combinations. Your choice. Repair abrasive thread mills for long holes. Please call MHI for boron nitride and diamond resurfacing. Deep dishes, pans and woks can be made GoldenBlue®. Even cast iron surfaces can be fully made nonstick (without seasoning). The treatment can be used for corrosion prone pipes as corrosion is seemingly vastly reduced. What is the simplest test one can perform to ascertain Non-Stick properties of a surface? Please scroll to the bottom of the page for the answer. These tests should be done over the life of a pan/utensil. Answer: The most important tests are the release efficiency and ease of cleaning discussed at the bottom of this page. A very simple test though could be a drying test. Non-stick surfaces seem to dry a bit more slowly when compared to their counterparts regardless of wettability. They may both dry fairly rapidly, but the non-stick appears to always dry a bit more slowly. To do the test one can drop a fixed volume of water on the surfaces to be compared and record the drying time. The temperature affects the process. Although not definitive by any means, this test seems very simple and useful. Sometimes an incline roll-off test is also done to ascertain speed of release, however for this test one should carefully check for any film left behind in the roll-off test. Wettability and Non-Stick are not the same properties. 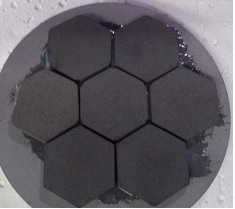 Wettable may in fact indicate stickiness as it depends on the particular liquid and the temperature of the test surface. Type of Tests that MHI recommended for Non-Stick Surfaces: Release, Incline, Permanency and Scratch Tests.... and most importantly the four main questions asked below which have to do with release. Stick and Non Stick surfaces generally behave very differently during cooking and cleaning. Cooking oils have a smoke temperature of about 180-260°C. Closer to this temperature or when exceeded, the non-stick surface properties change - so it is very important to examine the two practical aspects of 'release' and 'ease of cleaning' across the entire cooking and cleaning process as good measures for determining non-stick behavior. * Please note that no claim is made or intended to suggest that the GoldenBlue™ is for cooking or food contact. Such a claim has not been tested. Food contact surfaces need to be approved by the proper US Government agency. This has not been submitted or carried out for GoldenBlue™ service or dish. GoldenBlue surface is a steel or alloy surface with no extra additives. In many parts of the world, milk is boiled daily in all homes. This process leaves behind a sticky residue which is difficult to clean. In order to test the efficacy of GoldenBlue™, one cup of whole milk was boiled in both GoldenBlue and uncoated stainless steel pans. The results were significant. In the coated pan, most of the milk solids floated to the outer rim of the milk and did not adhere to the bottom of the pan. In the original pan, the milk solids settled uniformly over the surface that was exposed to the milk. This made it difficult to clean. The stick-resistance of the GoldenBlue pan made it's cleaning remarkably easier when compared to the identical original pan. What are the comparative non-stick release characteristics measured by MHI for GoldenBlue™ spoons compared to the original spoons? Experiment: The entire spoon was covered with peanut butter. The spoon was tapped on the side of a bowl, no peanut butter was released into the bowl. This is stick. Ease of cleaning: held the spoon under warm running water and rubbed with fingers, peanut butter film remained on the spoon, soap was required to remove and clean. Compare with adjacent spoon for GoldenBlue results. Experiment: The entire spoon was covered with marshmallow cream. The spoon was on the side of a bowl, no marshmallow cream was released into the bowl. This is stick. Ease of cleaning: held the spoon under warm running water and rubbed with fingers, marshmallow cream remained on the spoon, soap was required to remove and clean. Compare with adjacent spoon 2 results. Experiment: The entire spoon was covered with pizza dough. The spoon was tapped on the side of a bowl, minimal amounts of pizza dough were released into the bowl. This is stick. Ease of cleaning: held the spoon under warm running water and rubbed with fingers, pizza dough remained on the spoon, soap was required to remove the rest and clean the spoon. Compare with adjacent spoon 2 results. Experiment: The entire spoon was covered with pancake batter. The spoon was tapped on the side of a bowl, minimal amounts of pancake batter were released into the bowl. This is stick. Ease of cleaning: held the spoon under warm running water and rubbed with fingers, pancake batter remained on the spoon. Soap was required to remove the rest and clean. Compare with adjacent spoon 2 results. Experiment: The entire spoon was covered with peanut butter. The spoon was tapped on the side of a bowl, large amounts of peanut butter were released into the bowl. This is easy release. Ease of cleaning:held the spoon under warm running water and rubbed with fingers, peanut butter was quickly removed leaving no film residue with only the water rinse. Experiment: The entire spoon was covered with marshmallow cream. The spoon was tapped on the side of a bowl, minimal amounts of marshmallow cream were released into the bowl. This is easy release. Ease of cleaning:held the spoon under warm running water and rubbed with fingers, marshmallow cream was quickly removed leaving no sticky residue with only the water rinse. Experiment: The entire spoon was covered with pizza dough. The spoon was tapped on the side of a bowl, average amounts of pizza dough were released into the bowl. This is easy release. Ease of cleaning:held the spoon under warm running water and rubbed with fingers, pizza dough was quickly removed, leaving no residue with only the water rinse. Experiment: The entire spoon was covered with pancake batter. The spoon was tapped on the side of a bowl; large amounts of pancake batter were released into the bowl. This is easy release. Ease of cleaning: held the spoon under warm running water and rubbed with fingers, pancake batter was quickly removed leaving no residue with only the water rinse. The GoldenBlue™ spoons were noticeably easier to clean i.e. required less time and effort to clean. Experiment: Fried eggs (sunny-side up) were made on both a coated and the uncoated frying pan, holding the amount of oil, heating constant. On the uncoated, the edges of the white sizzled to form a nice brown crust much sooner. However, the uncooked white part remained transparent and uncooked in the center for much longer. The egg stuck to the pan on the uncoated pan, and was harder to remove. It had to be scraped off with the stainless steel spatula carefully and even then quite a bit of it remained stuck to the pan. In the coated pan, the crust did not form as strongly, but the whites cooked through faster, turning opaque more uniformly and quickly. On the coated pan, the release was easy and smooth in comparison. Cleaning the coated pan after use was much easier. Because the surface is hard, metal ladles and spatulas can be used. 1. Does the cooked food peel off reliably time after time? Are the release characteristics attractive? Yes for GoldenBlue™! 2. Is it easier to cook on and easily clean the new surface? Yes for GoldenBlue™! 3. Can one use metal spatulas or hard scrappers during cooking and yet not spoil the surface? Yes for GoldenBlue™! 4. Does the surface spoil permanently when overheated beyond the smoke temperature? No for GoldenBlue™. � Cast iron cooking surfaces (pans, griddles, grills) are wonderful to cook on - however traditional cast iron surfaces do not offer non-stick properties for cooking. 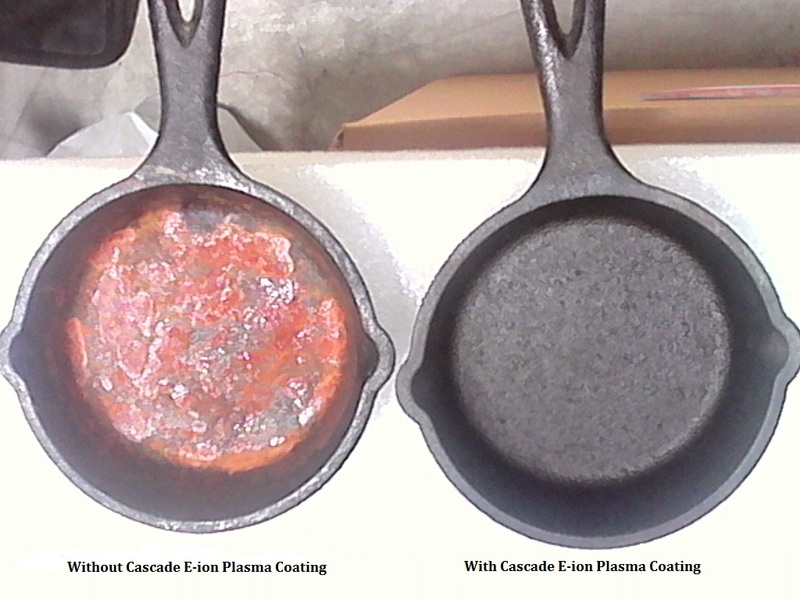 � Older traditional cast irons require to be periodically seasoned (with oil) prior to cooking - for rust prevention. � Experience a modern cast iron. Use the GoldenBlue�cast iron instead of a traditional cast iron. This modern cast iron offers improved corrosion resistance in addition to being stick-resistant. Stick resistance means easy to cook as well as easy to clean. With the GoldenBlue cast iron, one can use metallic scrappers and laddles. A traditional cast iron pan is often seasoned (i.e. a light layer of oil is applied) in order to prevent rusting. This is well known to users of traditional cast iron. So it was a surprise that after the GoldenBlue� treatment there was no visual rusting observed. A few user testimonials and pictures are as shown above and below. Question: Is there a simple test to assess the stick-resistance behavior of cookware? Does the cooked food peel off reliably time after time? Yes for GoldenBlue™ cast iron! Is it easier to cook and clean on the new surface? Yes for GoldenBlue™ cast iron! Can one use all types of scrappers and spatulas and yet not spoil the surface? Yes for GoldenBlue™ cast iron! Does the surface spoil permanently when overheated beyond the smoke temperature. No for GoldenBlue™ cast iron. Oils have a smoke temperature of about 180-260�C. The fatty acids which figure heavily in sticking properties change with the oil. Closer to the smoke temperature or when exceeded it, the non-stick processes may change quickly - so it is very important to answer the four questions above for your specific situation. Be one of the first to offer Non-stick cast iron. It is an opportunity that should not be missed. Please let us know any special instructions below. or the standard diameter for the plume. New ionic low-cost surface treating and deposition. Minimize pollution and minimize noise - improve energy efficiency.